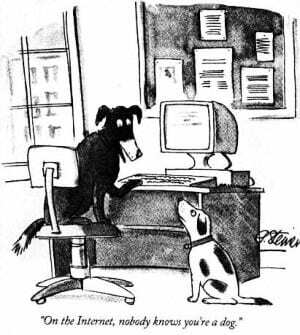 “Internet dog” by Source. Licensed under Fair use via Wikipedia. From what I can gather from my research, the answer is no. Feige is a member of many QQ groups and has his own fans who like to hear his opinions on everything. He sees entirely online friendships as ‘purer’ (chun) relationships, since they do not necessitate pragmatic concerns that often feature heavily in offline relationships. For Chinese migrant factory workers like Feige who are often frustrated by their position in society, social media provides new possibilities of sociality which are free from social hierarchy and social discrimination. Curiously, strangers online also boast a preferable situation in some factory owners’ eyes. Billionaire factory owners in my field site sometimes avoided attending school reunions in fear of requests for financial help from their old classmates but some were happy to talk with online strangers on WeChat to release the stress which they believed could not be displayed to their subordinates and family members. Ms. Cheng dared not attend any further school reunions after her unpleasant experience. However, she found a supportive community by joining a WeChat group where mothers share their experience of raising children. Here she could share her struggles of dealing with her two teenage children. This was a huge support which she felt she could not obtain from her family. Chinese migrant workers and factory owners probably lie at the two extremes of the wealth spectrum in the industrial China field site, however both appear to be similarly willing to befriend and communicate with strangers online. Here we can witness how relationships which are mediated by technology turn out to be the more ‘authentic’ compared to offline relationships which in many cases are highly mediated (or ‘polluted’ as people say) by factors such as wealth and social status. The cases from China provide us with a new perspective on online relationships. Here ‘anonymity’ by no means refers to the opposite of ‘authenticity’, just as ‘mediation’ by no means suggests less or more ‘authenticity’.